Work is progressing on transforming a 104-year-old commercial building in Teutopolis that has had many uses and names. 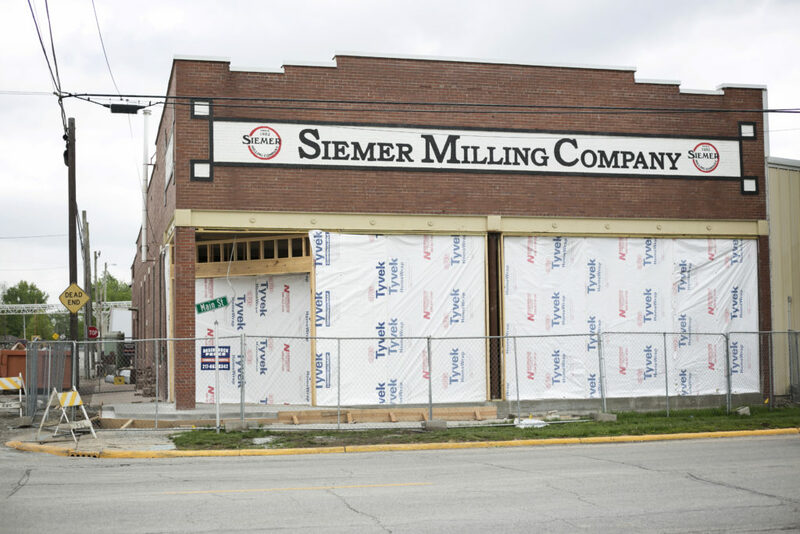 Siemer Milling President Rick Siemer explained the latest work on the building at the corner of Main and Green streets will include renovated offices for Siemer managers, an employee meeting area and a test kitchen. 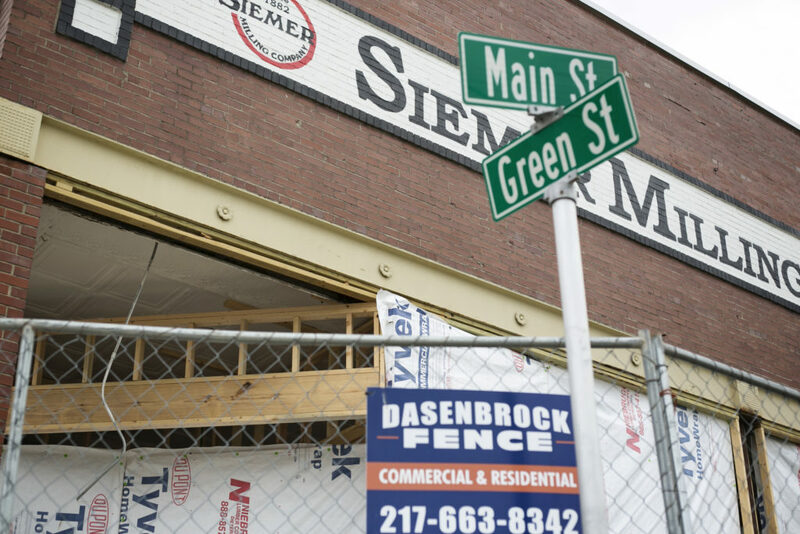 Siemer has owned the building for a quarter of a century and work has been underway for several weeks on long-needed repairs and other maintenance to the building first opened as a department store in 1913. “Things break or wear out after 25 years. With the company growing, we wanted a larger test kitchen and meeting area, and more efficient office space for supervisors. We want a cleaner, brighter space. We’ve had a lot of compliments on what we did with the office building and we want this building to measure up,” Siemer explained. 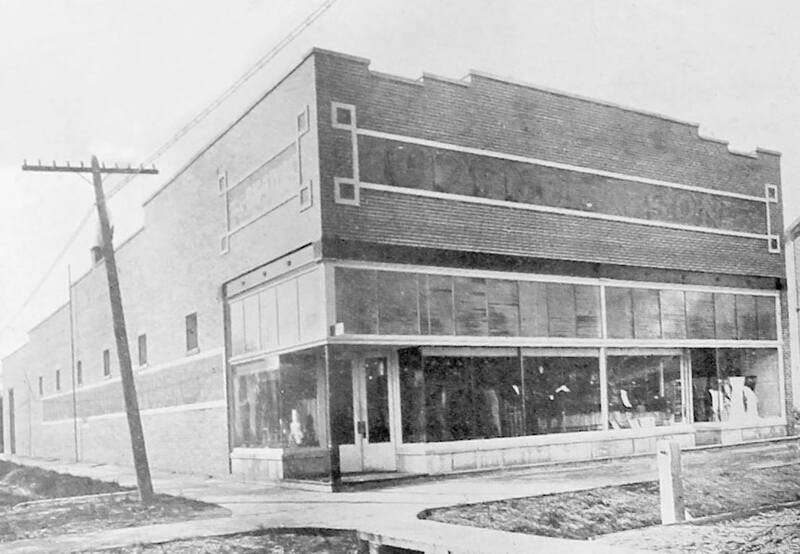 The building first entered onto the Teutopolis commercial landscape as the Uptmor Department Store. The Uptmor family’s ties date back to the founding of Teutopolis in 1839. Clemens Uptmor was a German immigrant with a talent for selling things. The first Uptmor business was located in the center of the village at the corner of Main and Pearl, Siemer explained. “Clemens Uptmor had an aptitude for being a merchant. He located his business at the corner where Wessel’s is today. In 1863, he built an L-shaped building that also served as his residence and continued as a store until demolished in 1979. After 1913, that building operated as Wessel & Fulle, then Wessel’s. He had wagons traveling with goods back and forth from the East long before the railroad came through Effingham County,” Siemer said. The Uptmor family and Teutopolis prospered over the decades. Uptmor invested in a grain mill in 1882 and engaged his son-in-law, Joseph Siemer, to manage it. When Clemens Uptmor Jr. died in 1906, just 14 years after his father, he was considered the wealthiest man in Effingham County. Shortly afterward, Joseph Siemer and his son, Clem, bought out the Uptmor interest in the grain mill and renamed it Siemer Milling Company. Clemens Uptmor III carried on with the family business and decided several years later to open a department store in Teutopolis. It would replace what was an overcrowded Uptmor store location at that time. For a young man, he had great expectations in the venture. The new brick building completed in 1913 was impressive by itself. But a brochure announcing the grand opening of the new Uptmor Store covered many pages of merchandise that rivaled the retail catalogs of Sears & Roebuck of that time and even stores in major cities. “They offered fine China and furs. There was elegant women’s clothing. You could order all kinds of items by catalog. These were items you might have bought in Chicago or St. Louis, but not in a town the size of Teutopolis,” Siemer said. Martin “Sonny” Hutmacher, who later worked in one of the manufacturing businesses in the former store building, said Uptmor was offering what we might compare to a Wal-Mart of today. But Siemer said at the time, many Teutopolis residents might have suffered from an early form of sticker shock. “They were advertising goods that you can’t imagine many people in Teutopolis really needing at the time,” Siemer said. There is an irony to this apparent commercial disconnect. Weber Brothers Clothing first started offering dependable work clothes and footwear more than 100 years ago. But today, the store is known for its suits and accessories for men, as well as tuxedo rentals. And connected to the clothing store is Weber Jewelry. Soon the fortunes of the third generation of the Uptmor family took a downturn and the department store closed after about 10 years. “The new store struggled. And it didn’t help when the hard (surfaced) road came to Teutopolis in 1921. With the train and a good road for cars, people could go elsewhere for fine goods. So the store did not last,” Siemer explained. The story goes that Clemens III would eventually lose his wealth and ended up living his final years with his wife in a tiny house next to Doc Runde’s office. It is not clear whether the store closure ended his financial well-being, but it had to present a challenge, Siemer said. Today, the family name that helped put Teutopolis on the map is only present on gravestones in the St. Francis Parish cemetery in the village. “There is no direct descendent of Clemens Uptmor in Teutopolis still named Uptmor. That name has just about left town,” Siemer said. The shuttered department store would then take on a new life as a Whippet car dealership with Ferd Althoff in charge for several years. The glass front and wide spaces were perfect for a car showroom. The Overland Whippet was produced during the late 1920s and into the Great Depression by the Willys-Overland Company, based out of Toledo, Ohio. The name Whippet refers to the breed of dogs known for being lean and fleet-footed. Motor vehicle enthusiasts might recall the most famous vehicle later made by Willys: The Jeep. During World War II, the Jeep allowed American and Allied forces to go just about anywhere overland across the globe. And nowadays, muddied-up Jeeps provide a windfall to car wash owners every spring and summer. Selling the Whippets proved a problem in Teutopolis. The cars had wooden wheels and some potential buyers scoffed at their durability, especially on the new hard-surface roads. Many local farmers at that time had been vexed by broken wagon wheels through the years. So there were some frowns on customer faces when they kicked the rubber tires and lumber wheels on the Whippets. That led to an interesting driving exhibition to change some minds on the Whippet wheels. “I met a Whippet dealer who used to work in Teutopolis. He said they couldn’t sell many because of the wooden wheels. So they hired a race driver who had been in the Indy 500 to drive one of those cars over the railroad tracks and make some moves to prove the wheels would hold up,” Hutmacher said. After the Whippets cut out with the departure of that dealership, some area residents were cutting the rug in the former showroom. That was during the days of the Rainbow Dance Hall. Many younger residents of Teutopolis from that time might have first spotted their future spouse at one of those dances. “They rented out for wedding receptions and for different dances. They had some good bands playing in there,” Hutmacher said. “My grandfather, Henry Hank, was a short-time owner. They had local players during the 1930s for different dances. And there were the square dances. As far as I know, it was not a tavern dance club,” said Phil Hartke, whose family has deep roots in Teutopolis. That’s not to say that alcohol was not consumed at some point before entering or exiting the dance hall. But sources indicated it was not a honkytonk. Still, at one point, the building was owned, and the Rainbow run, by Ambrose Braun. “Braunie” was reputed to have ties to bootlegging during Prohibition and later was the long-time proprietor of Braunie’s Tavern. In the 1940s, the old Uptmor Store entered into its manufacturing stage. Mary Ann Runde, retired teacher and Teutopolis native, said a glove manufacturing operation worked in the building. Then came the M. Snower Garment Factory in the late 1940s. There was also a manufacturing operation. “We had about 70 employees there in the 1950s for M. Snower. Sometimes, we had up to 90 helping make mechanic frocks, porter coats and chef cooks coats,” recalled Hutmacher, who worked for 32 years in the building as a plant manager and lived near the structure for many years. “It was the biggest manufacturing business in Teutopolis by far at the time.” Its work force was mainly women, some of whom operated sewing machines while others cut material. The company would later switch to making hospital apparel, including surgeon gowns, nurse dresses and patient gowns. This new line of clothing featured the newer lighter blends of cotton and polyester materials – it was called a 50-50 blend over time. The plant changed ownership later to Whitehouse Manufacturing. That operation would continue until the late 1980s. Over the years, Hutmacher would find out the Uptmor family had been innovative in the design of the structure. “They installed a water tank on top and a well in the basement. That way they had running water in 1913. That was not available across Teutopolis back then,” Hutmacher said. 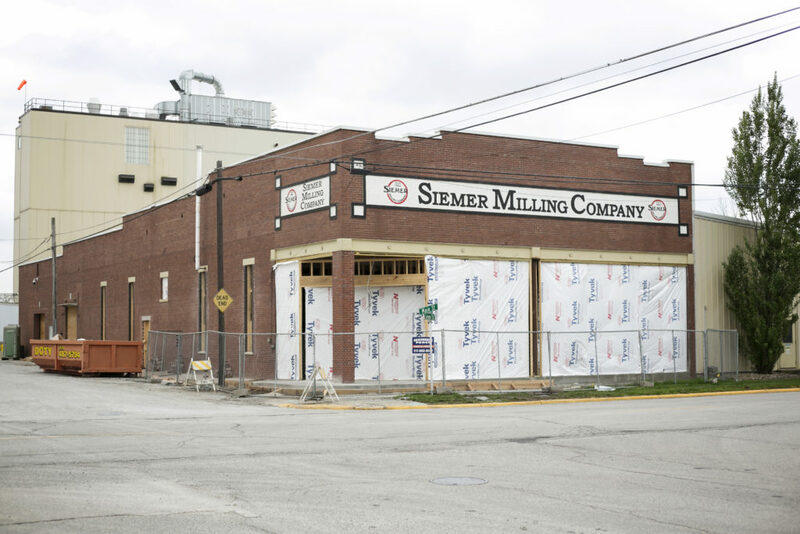 In the early 1990s, Siemer Milling, the new building owner, converted the old garment facility for office use and a meeting area for its employees and a test kitchen on its growing product line. Now after a century of service to the community, the building has a bright future with Siemer. Like many residents connected to the building’s past, Hutmacher is happy the old structure won’t be turned into a parking lot. “I’m kind of happy that it’s not being torn down. That has happened to other buildings in this town,” Hutmacher said.